Acquire Notes Address Book to Express In A Single Shot!! Installation of Lotus Notes 9.0 or below necessary for conversion. The software facilitates conversion of multiple contacts from Notes Address Book in .csv format which can be imported into Outlook Express. The contacts will be exported with associated multiple email addresses. Once scanned, the tool provides a preview of the scanned .nsf file with all the contact details. The entire information regarding a contact like business address, briefcase, etc. can be viewed with ease. After successful scanning of the contacts, the software lists contacts in an alphabetical order from A to Z. Just select and expand the letter and you can find all the contacts starting with the selected initial. 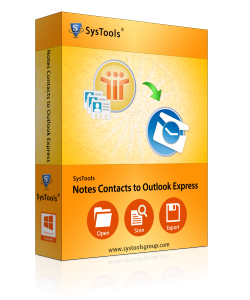 The software gives an option to export Notes Contacts to Outlook Express with selected fields. Just check and uncheck the fields that you want to export. By default, the software will export all the contacts fields from Notes contacts. The software is very easy to work with and can be used even by a naïve users. The whole conversion process is very simple. The simple user and single window interface makes the whole process very easy. Why To Choose Notes Address Book to Express Tool Over Others? Maintains all the fields in the contacts intact after conversion. The alphabetical listing of contacts facilitates makes it easy to search for a particular contact. The contacts are stored in CSV files, which can be easily accessed in Outlook Express. The option to exclude certain fields of contacts increases the speed of conversion of contacts. Will the software convert all the contacts from Notes file at once? How can one search for a particular contact in the scanned contacts list? After scanning, the software lists all the contacts in an alphabetical order starting from A to Z. Just click on the letter from which the name you are searching and view it. Where do the converted contacts get stored? Is it possible to convert selective contact fields? Is Lotus Notes installation necessary for conversion? Yes, it is necessary to install Lotus Notes in the conversion machine. Install Lotus Notes 9.0 or below version for performing the conversion. What Our Clients Say About Product?